Battery electric buses with zero tailpipe emissions have great potential to improve environmental sustainability and livability of urban areas. However, the problems of high cost and limited range associated with on-board batteries have substantially limited popularity of battery electric buses. The technology of dynamic wireless power transfer (DWPT), which provides bus operators with the ability to charge buses while in motion, may be able to effectively alleviate drawbacks of electric buses. In this study, we address the problem of simultaneously selecting the location of the DWPT facilities and designing battery sizes of electric buses for a DWPT electric bus system. The problem is first constructed as a deterministic model in which the uncertainty of energy consumption and travel time of buses is neglected. The methodology of robust optimization (RO) is then adopted to address the uncertainty. 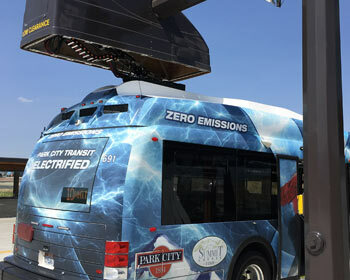 Numerical studies demonstrate that the proposed deterministic model can effectively determine the allocation of DWPT facilities and the battery sizes of electric buses for a DWPT electric bus system; and the robust model can further provide optimal designs that are robust against the uncertainty of energy consumption and travel time for electric buses. Song, Ziqi, Zhaocai Liu, and Yi He. Optimal Deployment of Wireless Charging Facilities for an Electric Bus System , MPC-18-359. North Dakota State University - Upper Great Plains Transportation Institute, Fargo: Mountain-Plains Consortium, 2018.